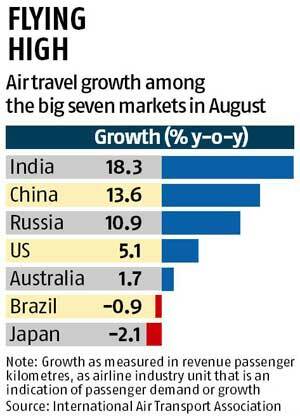 India continued to post strong air traffic growth in August, beating the top six domestic airline markets in the world. This was fuelled by airlines offering cheaper tickets due to a significant drop in the global oil prices. The increase in air travel demand and entry of new airlines AirAsia and Vistara also helped airlines fill more seats. According to the International Air Transport Association (IATA), traffic in India grew 18.3 per cent in August, highest among top domestic airline markets in the world, including China, which saw growth of 13.6 per cent in the same month. This was followed by Russia (10.9 per cent), the United States (5.1 per cent), Australia (1.7 per cent), Brazil (-0.9 per cent) and Japan (-2.1 per cent). “India’s domestic demand surge largely reflected increases in service frequencies and economic strength,” IATA said. 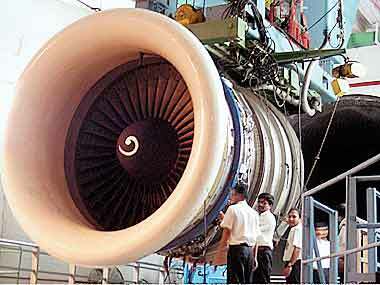 Jet fuel prices in Delhi declined by 36 per cent to Rs 43,184 per kilolitre in October this year compared with Rs 67,525 per kl in the same month last year. As a result, fares have been 15-20 per cent lower than the previous year, which helped carriers improve balance sheets. Low-cost carrier SpiceJet had posted profit of Rs 72 crore in the June quarter, compared with a loss of Rs 124 crore in the same period last year. Jet Airways posted a consolidated profit of Rs 226 crore in the June quarter compared with a consolidated loss of Rs 258 crore in the same period last year. IndiGo, the country’s largest domestic airline by market share, reported a net profit of Rs 1,304 crore for 2014-15 due to robust passenger growth. The aviation sector had seen a slow growth in the past few years, but there are clear signs of revival this year. According to the Directorate General of Civil Aviation, domestic airlines flew 52.3 million passengers between January and August, compared with 43.3 million in the corresponding period last year, growth of 21 per cent. Foreign tourist arrivals during January-August were up 4.5 per cent to 5.07 million on a year-on-year basis. CRISIL Research expects domestic air passenger traffic to record 15-17 per cent growth in 2015-16, driven by economic growth, largely flat fares and enhanced connectivity to smaller towns. In 2014, domestic carriers flew 67.3 million passengers, growth of 9.7 per cent over 2013. In 2013, domestic air traffic had grown 4.4 per cent over 2012, while 2012 had seen passenger numbers decline over 2011.